Cooking isn’t very much fun without a kitchen work center, and not just any kitchen work center, but one that is functional and efficient, that can accommodate multiple cooks if you have a spacious enough kitchen area. When you have a small kitchen it is still possible to make it work for you by using mobile work surfaces to supplement whatever small work surfaces you already have. It would be ideal to have a cleaning area close the sink for washing fruits, vegetables and meats, and for cleaning up bowls and pots and pans and utensils used in preparing the food, and of course a food preparation area, a cooking area near the stove, and plenty of storage for pots and pans, bowls and utensils. However, if you have a tiny kitchen there may not be enough space for these areas naturally. 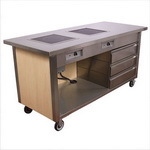 Creating a unique kitchen work center to suit your space requires planning. First you have to determine just what activities will take place in the kitchen. If you have a large space you can not only use the space to prepare food, cook food, and clean up after food preparation, but you might also have enough space to eat in the area. 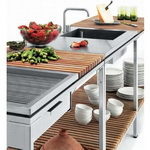 Once you have planned what will take place in the kitchen area, then you actually designate the space, and if the space is small then you can consider adding a movable island or kitchen cart. Kitchen equipment such as stand or hand mixers should be within easy reach as well as chopper and blenders, equipment that you will use most often in food preparation, also the different knives that you will use should be within easy reach of those that are preparing foods, but not within reach of small children or pets. In addition, spoons, whisks, and spatulas should be within easy reach since they are part of the food preparation routine. 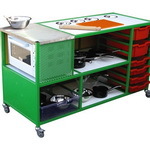 One of the things that I like about the mobile work centers and kitchen carts of today is that they often have storage areas right on the cart, and the great thing about these carts is that they have wheels which is what makes them so mobile, you can wheel them into the middle of the room if that is what you and move them into corner when you’re done, the same with many kitchen carts. There are also containers that you can sit right on the counter or work center with spoons, spatulas and whisks within easy reach, and knife sets generally come with their own knife block that can be used to not only store the knives but keep then organized and within reach, but out of the reach of children and pets, or they can just be kept in their own drawer if there is still a concern that they can be reached by children or knocked off the counter or cart by pets. Making sure that lighting in the kitchen preparation area is adequate is also a must, and it may in some instances be helpful to add some portable lighting that can be stored away when not in use. Storage for food preparation items such as spices is also a consideration to an efficient kitchen prep area, so that these spices are stored away from excessive heat, light, and humidity but also within easy reach for use. Need to Declutter That Kitchen? Here Are Some Great Tips.